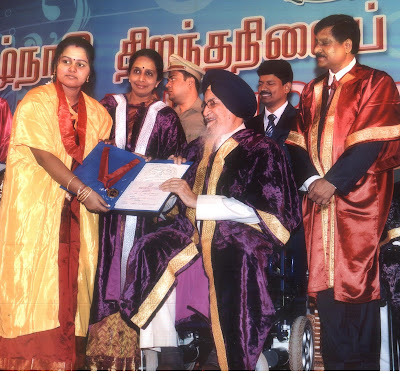 Governor and Chancellor Surjit Singh Barnala distributing degree certificate and medal to Karthika, a LRC student of SEVAI,Nagapatinam at the 5th convocation of Tamil Nadu Open University in Chennai, Vice-Chancellor, TNOU, Kalyani Anbuchelvan is in the picture. Chennai, 24: “Education is an awakening agent and the only force for the liberation of women, “said Governor and Chancellor Surjit Singh Barnala in the fifth annual convocation function of Tamilnadu Open University organised today here. Dr.Kulanthaisamy delivered the convocation address and conferred degrees on the students. A rural student from FdnF supported Learning Resource Centre from SEVAI; Nagapatinam Karthika was awarded the Certificate of Merit for holding high ranking in the University Exams. Dr.Kulanthaisamy, in his convocation address, congratulated the achievers and called upon them to face the challenges of life with a positive attitude while striving for excellence in every sphere of life. He said the rural learning centres such as SEVAI Nagapatinam Professional course caters to rural and students of interior villages with quality Education under Tamilnadu Open University. The term Open University is an integral part in the evolution of higher education and the hope for rural poor and also serves those live in interior villages and education would help women to learn..K. Ganesan, Principal Secretary, Higher Education, and Kalyani Anbuchelvan, Vice-Chancellor, TNOU, participated. Nearly 2500 students in Tamilnadu graduated at the convocation.Nagpatinam Professional course centre is situated in Gowen Dispensary premises,Mrs.Indirani,Coodinator of SEVAI and Director P.Chitra,Jona Kalavathy,Shanmuvalli and others congratulated the student Karthika. Etram News service.